The story of Adda Eldredge, Founding Mother of Illinois Professional Nursing does not include battlefields or the hospitals near them, like the stories of Florence Nightingale, Dorothea Dix or Mary Ann Bickerdyke. Her work to professionalize nursing was in the political arena. Her success is astonishing when one considers for a moment that when she was working for legal recognition of nursing at the turn of the 20th Century, universal women’s suffrage would not come until the passage of the 19th Amendment in 1919. Their success came at a time when they had to convince men to pass laws to make their visions reality. Adda Eldredge was born on November 27, 1864, in Fond du Lac Wisconsin. She would study at St. Luke’s Hospital Training School in Chicago. St. Luke’s, of course, is now Rush University, which proudly features Ms. Eldredge in their history as a member of the class of 1899. Adda Eldredge gained national and international recognition for her efforts to upgrade nursing education and promote sound legislation for nursing practice. After her graduation in 1899, the Illinois State Nurses Association enlisted her help to secure passage of a nurse practice act. She worked tirelessly to obtain support for the passage of the state’s Nurse Practice Act, developing a strong interest in legislative issues relating to nursing. Her work in that area was rewarded when in 1907, she received Registration Certificate Number One under the new Illinois nurse practice act. While she began her nursing career as a private duty nurse. Her career would have both national and international impact. From 1907 to 1914 she was an instructor at St. Luke’s. She would serve as president of the Illinois State Nurses Association and she would become first vice-president of the American Nurses Association. Beyond ANA, she held positions with the National League of Nursing Education, and American Journal of Nursing and During World War I, she worked with the Committee on Nursing of the Council of National Defense. Eldredge was on the board of directors of the International Council of Nurses (ICN) and ANA delegate to four ICN congresses. Somehow she found time to teach at Columbia University, work at the Association for Improving the Conditions of the Poor in New York City, and serve on the New York State Board of Nurse Examiners. From 1921 to 1934, Eldredge was the Wisconsin Director of the Bureau of Nursing Education. She improved nursing education and nursing practice by establishing high educational standards for schools of nursing through inspection and accreditation of school, shorter working hours and longer vacations for students, affiliation programs and the employment of well-prepared faculty and during that time would also serve as ANA president. In 1934, Eldredge returned to Chicago as director of the Nurse Placement Service, and taught nursing legislation at the University of Chicago and later at the University of Minnesota. Adda Eldredge is in the Nursing Hall of Fame. 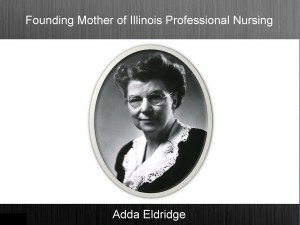 Ms. Eldredge’s work on the professionalization of nursing, her dedication to “getting things done” and status as the holder of Illinois Nursing License #1 qualifies her uniquely as the FOUNDING MOTHER of Illinois Professional Nursing.